Our Mech Hunter deck list guide goes through the ins-and-outs of this popular Hunter build for the Rise of Shadows expansion! This guide will teach you how to mulligan, pilot, and substitute cards for this archetype! Not a lot of archetypes have been pushed as hard as Mech Hunter in the last expansions. Ever since the downfall of Hunter’s initial fantasy including a lot of face-damage, other themes tried to find a new Hunter identity. Mech Hunter looks to reinvent the wheel by walking the line between being a power-spikey mid game threat and a defensive late game headache for its opponents. As expected, Mech Hunter profits from a surge of Mech support back when Boomsday Project released. Many theorycrafters already predicted that if Team 5 continued to push this minion type, Mech Hunter could become a viable deck list. And it did! Rise of Shadows brings all sorts of new Mech minions that try to save the floating city of Dalaran including Oblivitron or Safeguard. This example list has been played by High Legend player Mitsuhide. As already said, Mech Hunter needs to mulligan aggressively for its early game cards. Springpaw and Mecharoo as well as Headhunter's Hatchet are must-keeps against Druid and Rogue. The same goes for Tracking, if you run it in your iteration of the list. Animal Companion, Zilliax and Spider Bomb can be decent keeps as well, but only if you hit one or more cards out of your early game package. If you run Safeguard you have to remember that keeping a 6-drop in your opening hand against aggro may feel safe; however, it won’t be the correct keep in the long run. Mech Hunter has no real way to cycle through its deck except for Tracking, so looking for key mid game cards early makes the 1-cost spell a must-keep against control-style decks. Don’t forget that you need to time its use correctly to increase your odds of drawing and discarding the right cards at the right time! Other than that, your mulligan strategy against Warriors and other control classes is not too strict. Try to look out for obvious combinations in your mulligan like Ursatron or Spider Bomb together with Fireworks Tech; keeping secrets if you run them can pay off early as well! For the early game, Mech Hunter heavily relies on cheap but valuable minions; Mecharoo as well as Springpaw try to fit that role by providing continuous board presence. Together with Headhunter's Hatchet and Animal Companion, they form the early game package to hold off instant board pressure from archetypes like Token Druid or Tempo Rogue. In the mid stage of the game, our list wants to accumulate value and prepare big board swings. 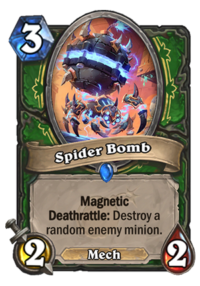 Spider Bomb serves as a great tool for minion-based removal against mid-game nightmares like Edwin VanCleef or or other big threats. 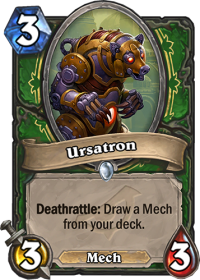 Ursatron, one of the new cards in Mech Hunter, proves to be a solid inclusion with average stats and a high-value deathrattle. Together with Houndmaster Shaw and Unleash the Beast, Rise of Shadows’ new 5-cost Hunter spell, you should have enough tools to keep the board clean. Turn 6 to 10 are where Mech Hunter players want to turn the game around in their favor. Oblivitron, one of two new Hunter legendaries, generates a whole new level of tempo play on the board. Especially when played together with Fireworks Tech, Oblivitron will create the board swing you need to overcome problematic board states. 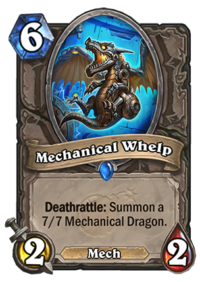 In the best case, your new 6-cost powerhouse will summon a copy of Mechanical Whelp as well as a 7/7 Mechanical Dragon, so you’d look at a total of 14/14 stats when combined with Fireworks Tech on turn 8. And not only that: Your opponent looks at a board full of high-impact deathrattles, so simple removal may not be the most obvious choice. This way Mech Hunter can interact proactively with the board over multiple turns which results in even more Deathrattle synergy! 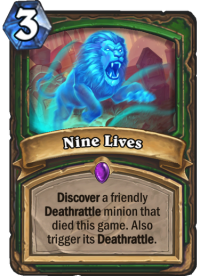 And that is where Nine Lives, a new Hunter spell from Rise of Shadows, really shines. If you look through all Deathrattle effects in the deck, you will note that this 3-cost value factory not only looks to become the most versatile Hunter spell, but also will always produce insane results on average. The general game plan for Mech Hunter plays out fairly simple: Try to aggressively mulligan into your early game life insurances and keep the board clean until you can overwhelm your opponent through Deathrattle synergies. And if everything fails until turn 10, you will always have everybody’s favorite Hero card Zul'jin as a backup plan. Mech Hunter’s playstyle against aggro opponents mostly depends on the deck itself. Many Mech Hunter iterations run Safeguard, which is obviously great against decks like Murloc Shaman, Tempo Rogue or Token Druid. Rise of Shadows didn’t produce as many good Taunt minions, and through Deathrattle synergy, you will be able to completely shut down the board pretty often. If you don’t play Safeguard you will have to manage your resources, especially when it comes to your removal kit. Depending on what your list includes you will have a combination of Marked Shot, Baited Arrowor Wing Blast at your disposal, maybe even Deadly Shot. Don’t be greedy with your removal, because it won’t pay off in a late game that you won’t live to see. Rat Trap and Snipe can dampen strong starts by aggro opponents, and together with Animal Companion you need to focus on keeping the board clear, even if you have to trade with low-health minions over and over again. 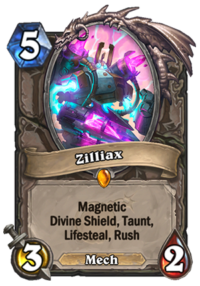 Zilliax is a key card in the aggro matchup because it’s your only reliable source of healing. In this case, greed might pay off in later stages of the game if you can manage to magnetize with one of your minions to deal more Lifesteal damage. In the end, less is still more, so try to get the most value out of Zilliax when you can. Against control lists as Mech Hunter, discpline is key. 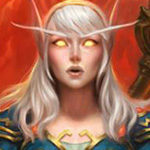 Your matchup against Warrior is very favored, but only if you manage your resources well. Again, Rat Trap and Snipe can give you an early tempo lead, but it’s imperative that you don’t overextend. Try to keep up a steady wave of board pressure, and if you fall behind on board, don’t hesitate to wait one or two turns to get maximum value through cards like Fireworks Tech or Nine Lives. The same goes for the use of Houndmaster Shaw; in the later stages of the game, an Oblivitron with Rush that pulls Mechanical Whelp can clear the board like nothing else while possibly leaving a substantial amount of stats on your side of the board. Last but not least, you have to squeeze as much value out of Zul'jin as possible, so don’t forget to keep track of the spells you’ve already played. Unleash the Beast and Animal Companion make a great team, and if you played the game right so far, it might become the final board filler that you need to finish off your control opponent. Snipe/Rat Trap/Secret Plan: As already said, the Secret package looks to be included in most lists that try to do well against control-heavy decks, and they should do fairly decent in aggro matchups as well. Cards like Explosive Trap and Snake Trap may produce value if the meta shifts towards more aggressive archetypes, and if you can’t decide, you always have Secret Plan as a backup! Baited Arrow/Wing Blast: Depending on the opponent, both cards can perform incredibly well. On the long term, Baited Arrow should have the upper hand, just because Hunter synergizes so much with spells that combine removal and board presence. 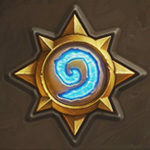 However, if decks like Tempo Rogue and Murloc Shaman should reign the tier lists, Wing Blast becomes a more than viable option. Bomb Toss: Obviously, this spell improves your win rate against aggro decks. However, it still pollutes your Deathrattle pool in the long run. At the moment, the meta still looks aggressive enough to run two copies of it, but that could change soon. Zilliax/Oblivitron/Houndmaster Shaw: If you hope that the legendary cards in this list are in any way replaceable, you will be in for a sad ride. 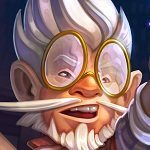 All three legendary minions will be more than mandatory, especially in the long run of the evolving meta game. However, you may be able to switch out Houndmaster Shaw for another mech like Replicating Menace, which will net you more instant mid game board pressure but less swing potential. Zul'jin: As said before, Zul'jin is an incredibly important card in this deck and not replaceable. 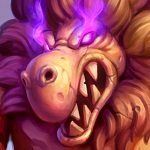 Many players will note that the interaction with Tracking looks counter-intuitive, but in most games, Zul'jin wants to end the game on the next few turns. It can be your last-ditch effort against control opponents, or your emergency life insurance in a matchup against aggro. Safeguard: Looking at our deck and its synergies, it looks ridiculous to not include Safeguard into our Deathrattle Mech lineup. But even though Mech Hunter might have a limited amount of tools to deal with early board states, it should be enough on average. Other cards like Baited Arrow help to improve our best matchups even more, which makes this deck so strong in the first place. Safeguard can cause problems and hard decisions with Nine Lives and Fireworks Tech, two cards that should exclusively interact with Oblivitron and Mechanical Whelp. Acidic Swamp Ooze: Weapon removal pays off big time in the first weeks of the fast-paced Rise of Shadows meta. Bomb Warrior and Tempo Rogue use a plethora of weapons, and the inclusion of Acidic Swamp Ooze becomes almost mandatory. But it’s hard to make room for it. You could run only one copy of Animal Companion or Marked Shot, but in the end you need to look at the current meta game and how it plays out for the archetype. I noticed that you cut out Mecharoo from last week’s theorycraft version–I like that. Mecharoo is an OK 1-drop, but unless you just need the tempo there are so many better cards to play. A note to anyone who might be playing on a budget: mech hunter is just a really powerful AND FLEXIBLE archetype. Unlike a lot of other meta decks which fall off hard if you don’t match an exact decklist, mech hunter can accommodate a lot of substitutions with only minor degradation in winrate. If you happen to have a Nine Lives, Oblivatron, or Zilliax, all the better–they just augment the value of your other cards. If you instead have cards like Flark, Undatakah, or Necromechanic: they work too, just not as good as the aforementioned. I highly recommend experimenting with this archetype using whatever cards you have on hand. I personally like Shimmerfly. Doesn’t really “pollute” the Deathrattle pool often and will more than likely give you a very useful Spell after it dies. I know it’s too early to tell and more refined versions will pop up in the near future but it almost feels like Oblivitron doesn’t belong in this deck. The dedicated strategy IS to spam Mechanical Dragons by activating M. Whelp’s Deathrattle through Fireworks Tech & Nine Lives (and Whelp itself, obviously) and Ursatron does a good job of adding the necessary mechs to your hand. Zilliax is also necessary ’cause it’s the only way to heal in this deck. Oblivitron and Spider Bomb…kind’a mess with Ursatron’s consistensy. Moreover, Oblivitron needs pretty specific circumstances to work well, especially by turn 6. And you’re often better off dropping a Whelp instead. And not include Spider Bombs and Oblivitron. I can see the Spider Bombs becoming “a must” depending on the meta, but I feel like most of the time they’re too awkward to drop and mess with Ursatron. Woops! That’s 1x Zul’Jin. Don’t wanna get too greedy. I’ve used Oblivatron every match. The card I’d consider cutting is Houndmaster Shaw. With so many rush minions in the deck, his only real use is to hope he lines up with Oblivatron AND Whelpling. 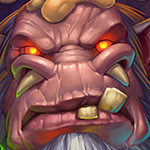 I’m thinking of replacing him with The Undatakah. I can understand the general sentiment of Oblivitron being perceived as a bad inclusion. In the past, a mediocre stat line compared with the effect would’ve not been used at all. However, besides Conjurer Mage, Mech Hunter is the only deck that can create insane board swings in the mid game, and that alone justifies Oblivitron being used. In the Year of the Raven, Deathrattle Hunter was successful because it was able to make DR usage more flexible, and Oblivitron continues to do that. With your inclusion you only have Fireworks Tech to make immediate use off of Mechanical Whelp. Through Oblivitron you not only have more opportunities to immediately trigger Mechanical Whelp, but it also makes Nine Lives more valuable in the long run. In the end you’re including one singular card to exponentially improve your deck’s overall performance. 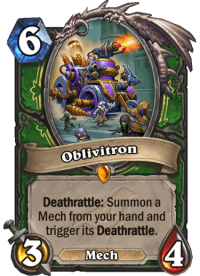 A lot of cards are open for discussion in Mech Hunter, but Oblivitron will not be one of them. It’s the backbone of this list and its game plan. I can see your point. I’m probably just not familiar enough with the card to make it work well enough. I’m also feel kind’a awkward with how “cloggy” it feels around 5-6 mana. Too many 6 cards, especially if you count the additional two Release the Beast. I prefer the list with the 5-cost minion that deals 4 damage if you hold a 5+ spell in your hand which makes Mech Hunter have some very awkward turns. Sunreaver Warmage is one of the strongest cards in RoS, so including that might pay off big time. Things are there to try them out! Thing about Oblivitron is: I rated the card very low and was of the same opinion as you, but it just works too often to not include it. Why would you keep spring paw against control? Copy and paste error, corrected!